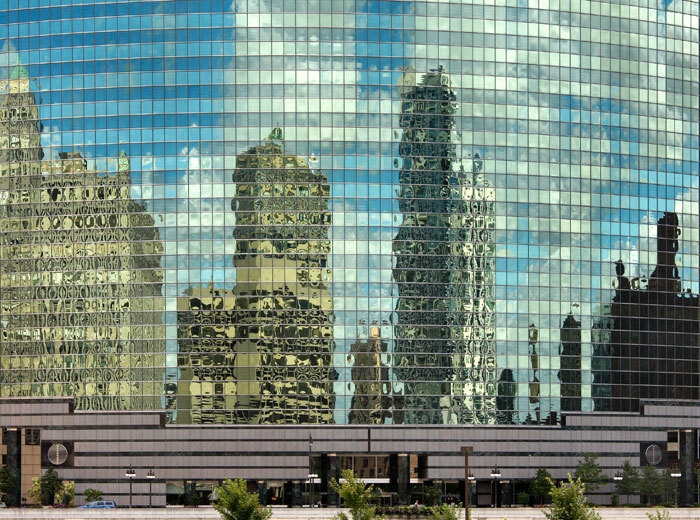 Completed in 1983, this 36-storey office tower fronts the Chicago River as it turns through ninety degrees on its course to Lake Michigan. Its principal façade echoes that curve but the others are aligned with the rectangular street grid. Designed by Kohn Pederson & Fox Associates, the veneer of green glass contrasts with the solidity of the Vermont marble and granite used at street level. 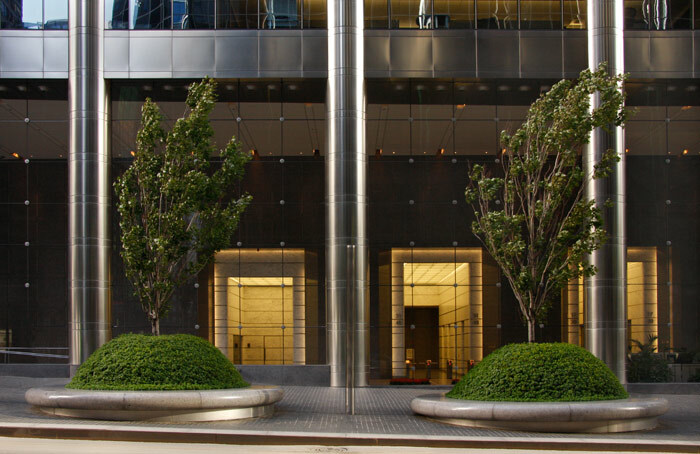 Kohn |Pederson & Fox also designed 191 North Wacker Drive set across West Lake Street from 333 West Wacker Drive. Like its neighbour, its open aspect allows the 36-storey façade to reflect light, weather and its opposing buildings. 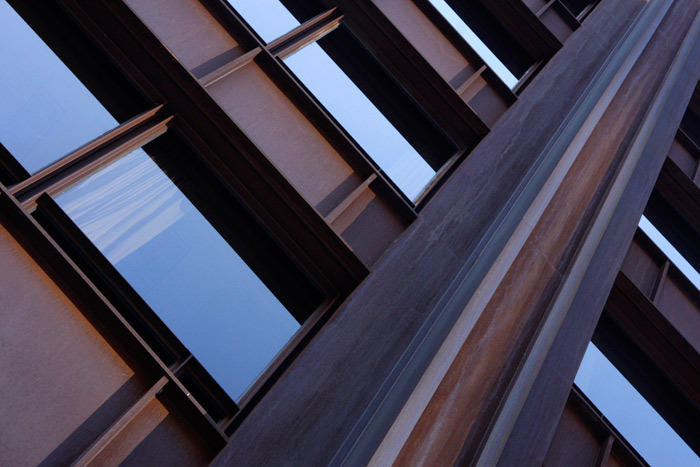 In this image, late afternoon sun lit the low South Clinton Street façade of the Heller International Building and the rear of its 45-story tower fronting Canal Street. Built to designs by Skidmore Owings and Merrill, it was completed in 1992. The Butler Brothers Warehouses I and II were designed by Daniel H Burnham & Co and completed c 1917 (I have read conflicting dates). Both buildings have been restored; Warehouse I continues in commercial use whilst Warehouse II has been converted into apartments. I liked the proportions and detailing of the dark red brick façade above the street parade of iron-framed windows set into red granite. 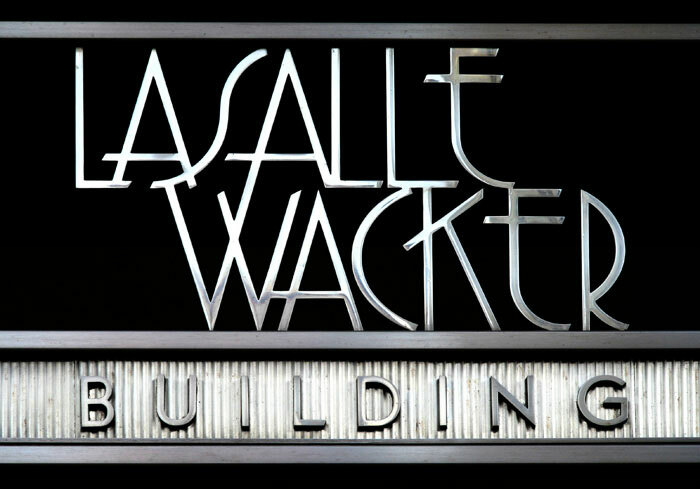 This building stands at the junction of La Salle Street and West Wacker drive, hence the name announced by this entrance lettering. 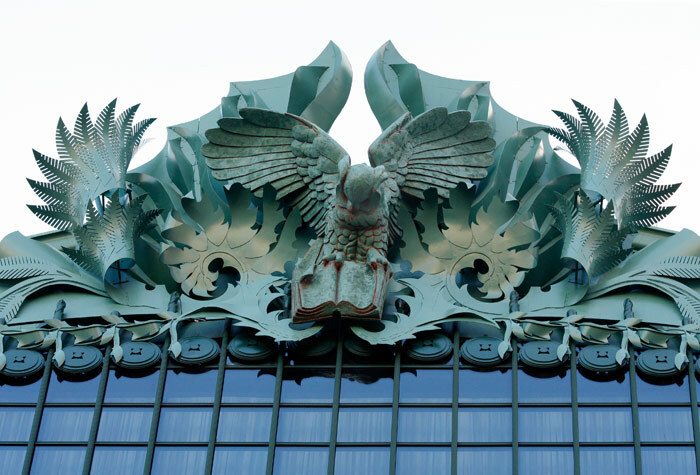 Completed in 1930, it was designed by Holabird & Root in association with Andrew Rebori. The building has a classic thirties “armchair” plan, with a 3 storey “seat”, 20-storey “arms” and a “back” reaching 41 storeys. 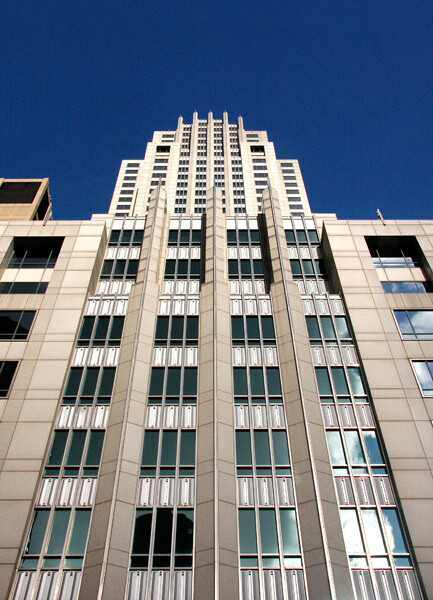 Art Deco in style and detail, the building is faced in grey limestone. 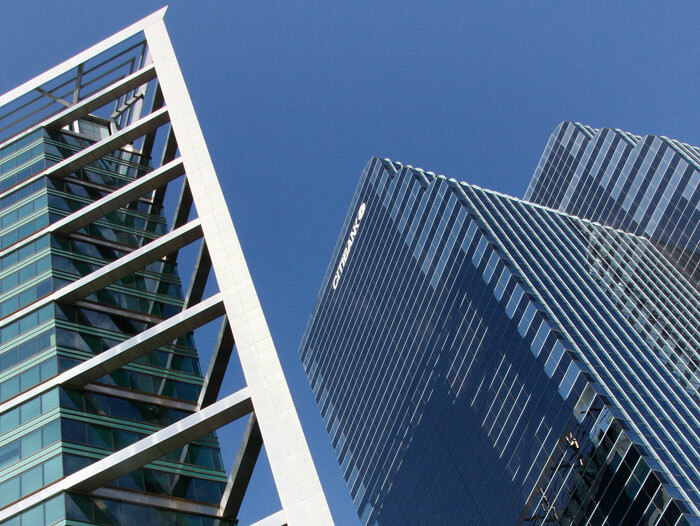 The ABN AMRO Plaza was completed in 2004 to designs by De Stefano & Partners. Best described as a trapezium in plan, the 29-storey tower rises from an essentially rectangular base: this is a detail from the tower’s sharply angled corner on West Madison Street. The Citicorp Center was designed by Murphy /Jahn and dates from 1987. See the “CHICAGO – MAINLY BLACK & WHITE GALLERY” for more images and information. Bought by The Boeing Company in 2005, this building was designed by Perkins + Will and completed in 1990. It occupies some of the “air rights” space over tracks to the Union Station; train operation was uninterrupted during construction. L-shaped in profile, the tower element has 36 storeys. The floors of the lower horizontal extension are suspended from the steel trusses visible in the image. 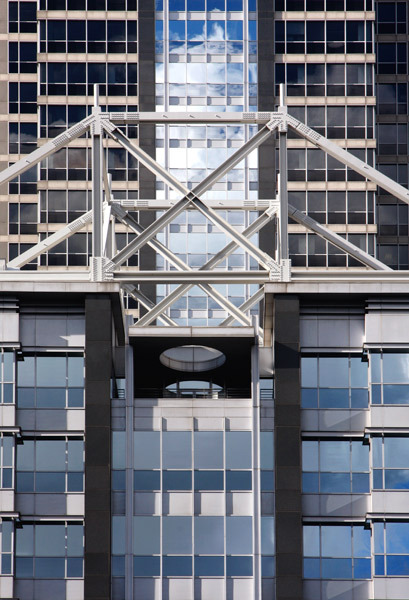 Murphy/Jahn designed 1 South Wacker Drive in 1979 and it was completed in 1982. Stepped set -backs to the 40-storey tower, chamfered corners and a triangular open pavement area at the street junction contrast with the monolithic box forms of many of its neighbours. 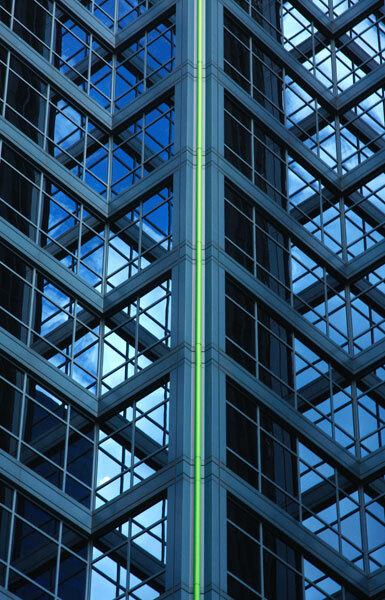 Variations in glass tints from dark to light and their perpendicular organisation enliven the façades. 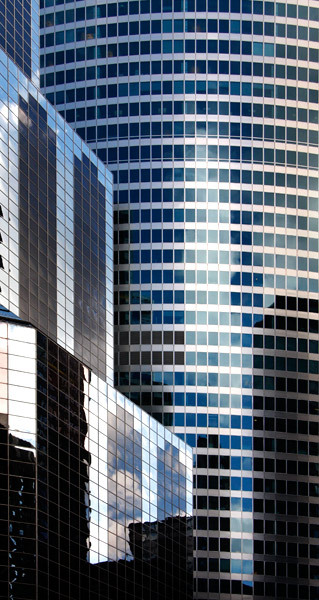 In this canted image, a fragment of the stepped west elevation of 1 South Wacker Drive lies alongside a glimpse of the Hyatt Center’s low-rise base block and its 48-storey tower. The latter tower’s main facades are opposed wide-radius arcs indented at their acute meeting points Designed by Pei, Cobb, Freed & Partners, the 2004 building’s underlying rectangular ground plan occupies a whole city block. 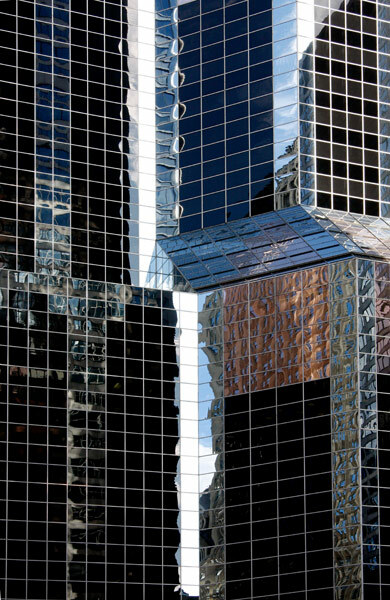 The Hyatt Center’s silvery stainless steel skin and aquamarine glass reflect light into the dark streets of the area and in this evening light glistens against its darker masonry neighbours. The long curve of the West Monroe Street façade allows grassed and planted areas at street level; the tall entrance area is extensively planted. 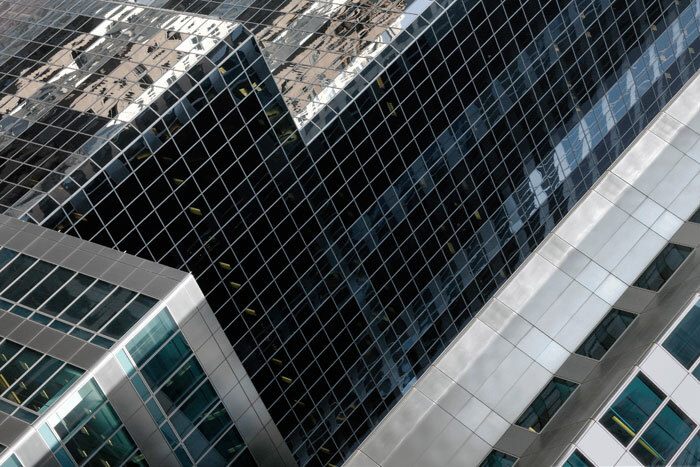 The UBS tower design by Lohan & Associates also makes extensive use of stainless steel in its exposed structure. This photograph shows a portion of the longer West Madison Street façade. I liked the contrast between the gentle street gradient and the horizontals in the building, the repetitive elements and the failing daylight on polished steel set against the interior lighting. 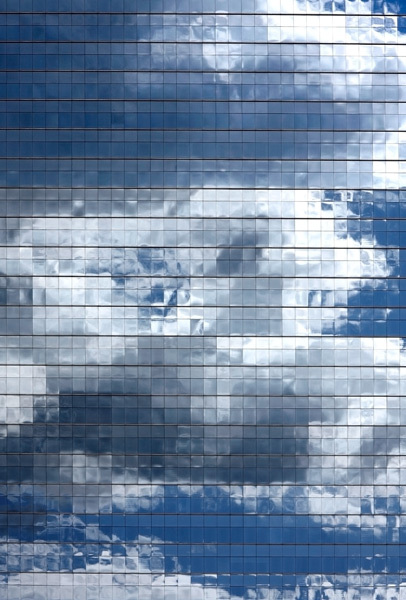 This is one of eight aluminium sculptures by Kent Bloomer and Raymond Kaskey atop the glass curtain-walled tenth storey of this massive building. Hammond, Beeby & Babka’s Beaux Arts and Neoclassical referenced design won the 1991 competition. Built in dark red brick on a matching granite base, it is controversial for both its style and as a practical environment for rapidly changing library practice and technologies. This is a detail from the La Salle Street entrance to the 1888 twelve-storey building by Burnham & Root. Its load bearing marble, terra cotta and brick facades surround an internal iron frame. The magnificently decorated and glazed light court, remodelled by Frank Lloyd Wright in 1905, is a spectacular space within the building. 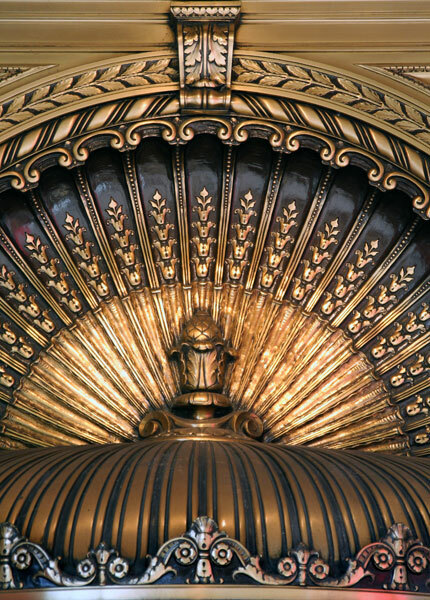 Externally, the rich ornamentation makes reference to a number of styles. This 1904 building was designed by Daniel H. Burnham & Co for the Aitchison,Topeka & Santa Fe Railroad. 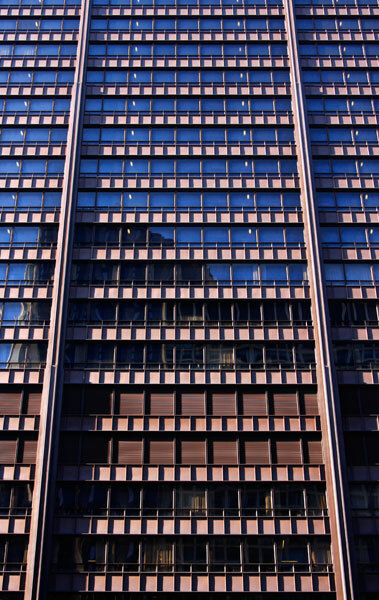 Its shortened name still tops the seventeen storey white-glazed terracotta façade that faces the Art Institute of Chicago building and Grant Park across Michigan Avenue. 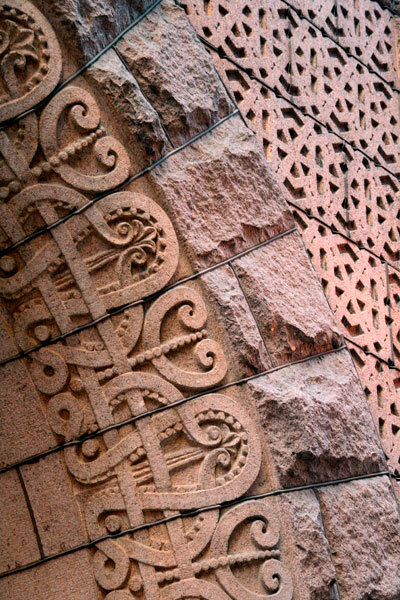 This is a detail from the doorway into the Chicago Architecture Foundation’s shop, a motif that recurs in other Loop buildings of the period. Jacques Brownson of C.F. Murphy Associates designed the Chicago Civic Centre, completed in 1965, and commissioned Picasso for a sculpture to stand in the public square fronting the building. Untitled by the artist, its form caused some controversy at the time. The “Corten” steel that weathers to create its own protective rust coating was used in fabricating both sculpture and building. The Center houses City Government offices and law courts. Its tapering cruciform-section exterior columns in “corten” steel carry the whole structure, so leaving the interior column-free. Although only 31 storeys high, the high ceilings of the law courts make the overall height equivalent to a conventionally floored building containing an additional ten or more floors. The exterior columns are very substantial and with the exposed steelwork of each floor seem more akin to bridge construction than architecture. I was struck by the myriad variations in the colour tones of the surface rust, the patterns created by running water and the visual changes wrought by the shifting daylight focus. The intense blue of the late afternoon sky added a further dimension. This 37 storey design by Moriyama & Teshima dates from 1986. 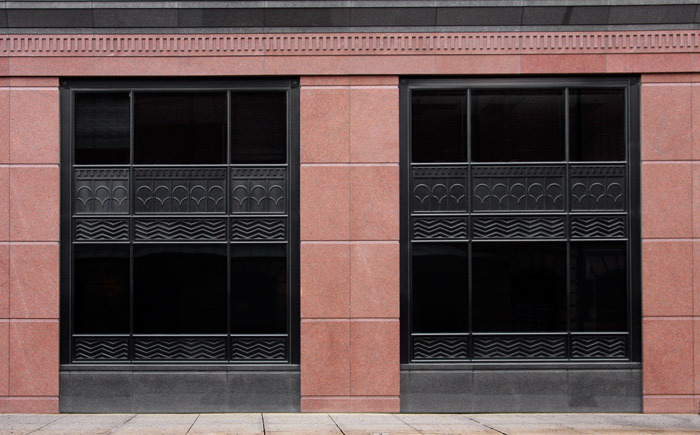 Its La Salle and Madison Street facades retain the four-floor neo-classical masonry of the Otis Building completed by Holabird & Roche in 1912. The combination of structural blue aluminium and green tinted glass is unusual but the style of the preserved stonework remains as a visual link to neighbouring contemporaries.